Eyeing a new location for your plant or DC? Make sure it's rail/intermodal accessible, and served by progressive transportation providers. Rail is resurging. After more than one decade during which a combination of sea, air, and over-the-road addressed most shippers' transport needs, a myriad of forces is bringing domestic intermodal rail back into the picture. 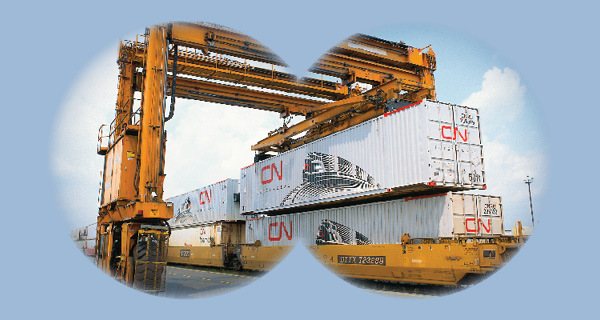 Acknowledging the challenges confronting motor freight carriers—from driver shortages, Hours-of-Service regulations, and electronic log book requirements to rising fuel costs and declining road infrastructure—railroads have been improving track and facilities, as well as service offerings, to meet the needs of a wider array of shippers. The level of coordination among modes is also on the rise, as trucking companies use rail for some legs, and vice versa. At the same time, shippers are shifting their approach to manufacturing by moving final assembly processes closer to market. As they reconsider their networks, shippers are viewing rail as an opportunity to bypass busier ports, speed shipments, and find new ways to get to customers. There are a number of factors to take into account when selecting a manufacturing or distribution site near an intermodal facility. The basic steps for choosing an industrial site include a logistics lane and centroid analysis; site screening and selection; site visits; and negotiations, according to Bill Luttrell, senior locations strategist for transportation and logistics provider Werner Enterprises. If one goal is to increase intermodal use, that analysis should consider intermodal facility availability early in the process. Lane and centroid analysis uses software to identify regions that satisfy needs, such as proximity to suppliers or customers. A pro forma analysis looks at a shipper's needs over the next three to five years. If rail access is a criteria, for example, the analysis looks for facilities within approximately 300 miles of identified regions. Access to major truck corridors. Workforce availability and readiness. Some verticals require access to seasonal workers to accommodate surges. Competition for labor is also a factor. Some locations also stress the availability and training of truck drivers. Intermodal facility location and characteristics. Intermodal facilities that have invested in state-of-the-art cranes can load and unload more efficiently, speeding cargo transfers. Some offer specialized capabilities, such as handling trailer on flatcar, or reefers. Proximity to customers and/or suppliers. Site characteristics, including the cost of land, and the availability and readiness of utilities. Incentives. Many state and local governments have prepared packages of tax advantages to attract shippers. Availability of a foreign trade zone, if applicable. Livability. The cost and quality of life for workers. In site visits, shippers typically meet with officials and interview shippers already operating in the area. Some companies engage a site selection consultant to steer them through the process. Although Werner is a trucker at heart, "we are one of the few large transportation and logistics companies offering site selection services," says Luttrell. "Location is an integral piece of the supply chain puzzle, so we build our site selection process heavily around logistics and supply chain factors." Luttrell is responsible for advising clients on where to build manufacturing and distribution sites, as well as for the carrier's own site selection process. That includes locating in intermodal facilities. Werner embraces appropriate use of rail. "We look at intermodal as yet another way to move goods on behalf of shippers," says Luttrell. "We encourage intermodal where it makes sense." The growth of intermodal transportation has outpaced the infrastructure investment required to support it. One value proposition of Watson Land Company, based in Carson, Calif., is that it has been steadily making strategic investments to support intermodal's growing popularity with shippers. Watson Land Company, which recently celebrated its centennial, develops, owns, and manages industrial properties throughout southern California. Watson Land Company has developed several million square feet of master-planned centers within four miles of the ports of Los Angeles and Long Beach, and maintains a footprint that includes facilities in Carson/Rancho Dominguez, Chino, Apple Valley, Fontana, and Redlands, Calif. The company recently leased a 553,963-square-foot industrial property to M. Block & Sons in Redlands. The building is a part of Watson Land Company's Legacy Building Series, an initiative to develop and offer highly flexible, Class-A industrial facilities with distinctive architectural detail. The property will be used for warehousing, distribution, and managing third-party logistics. Watson Land Company's legacy extends back two centuries to the Rancho San Pedro Spanish Land Grant. Today, the company is among the largest industrial developers in the nation. Watson holds a Foreign Trade Zone (FTZ) designation on more than eight million square feet of its distribution buildings. The FTZ designation allows customers to significantly reduce operating costs through such methods as single weekly entry of containers, which reduces merchandise processing fees and duty deferral. Watson Land Company affirmed its commitment to sustainable design by becoming the first developer in southern California to design and construct speculative buildings in accordance with the U.S. Green Building Council&apos;s Leadership in Energy and Environmental Design (LEED) guidelines. Each LEED-certified building features design elements, materials, functionality, and construction procedures that reduce environmental impact, enhance energy efficiency, and reduce operating costs. Watson Land Company has completed construction on more than two million square feet of speculative industrial buildings designed for LEED certification.